Growing methods ...... Why grow hardy orchids? ...... Where to grow them? Orchid Meadow is a mail-order plant nursery, started by Tony Heys in April 2006, specialising in terrestrial orchids. 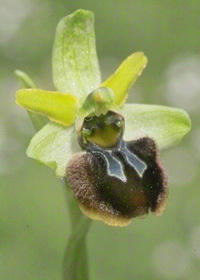 The emphasis is on orchids native to the U.K. and Europe. I am aiming to expand the range of species offered each year. The plants for sale are all grown by me either from seed or propagated by division of stock. The orchid material used is obtained from legal sources. The seeds of orchids are tiny. When heaped together in large numbers they resemble fine sand, and so each one contains very little stored food. It is believed that, in the wild, all orchid seeds need the help of a fungus to provide nutrients before they can germinate and grow. Initially, the seeds develop into small hairy structures called protocorms, which enlarge to be about half a centimetre long. Next, the first green shoot develops, allowing the orchid to start making its own food by photosynthesis. Thereafter it grows over several years into a plant which may or may not be independent of the fungus. A consequence of this lifestyle is that it is very difficult or impossible to germinate orchid seeds by typical gardening methods. Seeds can, however, be induced to grow on nutrient media under sterile conditions, either alone (asymbiotic method) or with the help of a suitable strain of fungus (symbiotic method). 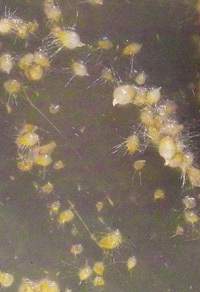 Protocorm formation may take a few weeks or several months. A transfer to fresh sterile medium is usually then needed to maintain steady growth. 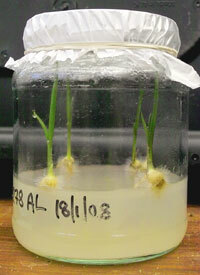 After another incubation period, a green shoot forms followed by the first roots developing near the base of the shoot. The entire development up to this point can take from a minimum of around 4 months to more than a year. At the small seedling stage there is no longer a need for a sterile environment, and they can be potted up into a suitable compost. Although delicate, their treatment is now fairly conventional, and after "hardening off" over a few days, they are raised in a cool, well-ventilated greenhouse. In the first season, the young plants usually develop only two slender leaves, up to about three inches long, while the first small tuber develops within the soil. 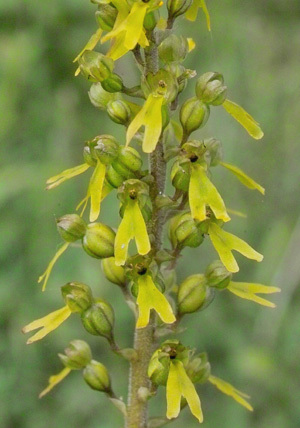 If good growing conditions are provided, many species will go on to reach flowering size in their third growing year. I have always been fascinated by finding and photographing hardy orchids in the wild, and I still feel nothing beats the thrill of coming across a species you've never seen before. But a few years ago it occurred to me - why not grow them in the garden, like other wildflowers? I soon discovered others were already doing just that, so I decided to join them, and became a hardy orchid grower. I have found that having orchids at home is just as rewarding as seeing them in the wild, but in a different way. You get to know the plant better, and have the great satisfaction of seeing it flower under your care. Orchids have never been the most commonly found of our wild flowers - surely part of their appeal. It is a sad fact, though, that many are steadily declining in numbers or becoming very rare in the U.K. due to loss of habitat. If we can provide that habitat in our gardens and grow orchids then this can be extremely beneficial for orchid conservation. For the same reason, it is of course absolutely imperative not to do this by transplanting orchids from the wild into your garden! - this is illegal anyway. I hope that by making legally grown orchids available to buy from Orchid Meadow and other providers that this can help us to conserve and maintain orchid numbers. Our gardens are a very important habitat for wildlife of all kinds as they constitute an enormous land area of the U.K., estimated at more than 2 million acres. 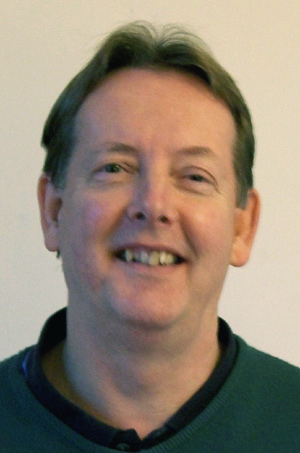 They could be supporting biodiversity to an even greater extent than they already are. If you still think orchids can't grow in gardens, let me say that last summer alone, I was privileged to be allowed to visit two meadows in private gardens, one of which supported 4 orchid species and the other 12 species - several of them introduced by the owner. I also saw examples of D. fuchsii, A. pyramidalis, E. helleborine, N. ovata and C. damasonium growing naturally in private gardens. Orchids can be grown successfully and to great effect in a variety of places in the garden. These include raised beds, rockeries, borders, and containers, which can all provide the moist but well drained conditions that are required. 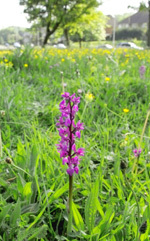 You do not need to have a marsh in your garden to grow Marsh orchids. Bog gardens and damp ground surrounding ponds can also be good settings, but it is important to realise that most orchids do not like very wet conditions at or near the soil surface. Even the so-called Marsh orchids (Dactylorhizas) like their tubers to be well drained with theroots growing down into wetter regions below. My particular interest is to grow orchids in wildflower meadows – to me the setting that displays them best. Mini-meadows can be created in the very smallest of gardens, or even by carefully neglecting part of your lawn - a tempting approach for many, perhaps? In a large garden, there can surely be no excuse for not having one! Public spaces such as parks, road verges, and large roundabouts with suitably poor, often alkaline soil are increasingly being managed as wildflowers meadows. They too are a valuable habitat for orchids.